August 4th, 2018 was round 7 of the 10 race Continental Sports Car Challenge championship, and the #39 Audi From Carbahn/Peregrine Racing was present with Californians Jeff Westphal and Tyler McQuarrie at the helm. Coming off a disappointing DNF from Limerock due to a collision leaving pit lane by an unaware driver on track, the team looked to rebound from the non-result to get some retribution at this picturesque weekend. 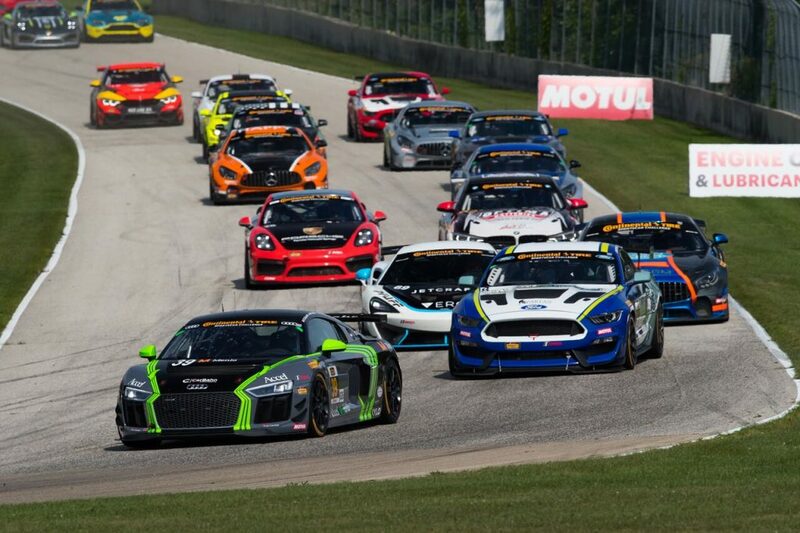 Road America, a North American historic course in Elkhart Lake, Wisconsin is 4.5 miles of green countryside through rolling hills in America’s Dairy land. With Long straights, big brake zones, and many slow speed corners it generally rewards aerodynamic down force and horsepower, which in Current IMSA Mandated Balance of Performance, the Audi R8 is not the strong in either of those categories. Balance of Performance is series mandated intake air restrictor, vehicle weight, ride height, wing height, fuel capacity and fuel fill rate, which can be adjusted at the series discretion. For example, this race the Ford Mustang received 4mm more of intake tract, which is roughly a 35-40hp gain. With that said, it was clear in Official Practice 1 that this weekend’s success wouldn’t come from on track speed, yet from witty fuel management and race craft. 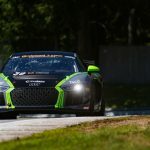 Westphal and McQuarrie’s R8 was 2-6mph down on the straight from the various brands of competitor’s cars, and could do 3-6 minutes less running on a tank of fuel to the other cars. With this in mind, both drivers had to save fuel, and stretch the mileage under the caution from the #9 and #33 car crash that lasted 15 minutes to clean up and take the drivers to the hospital. 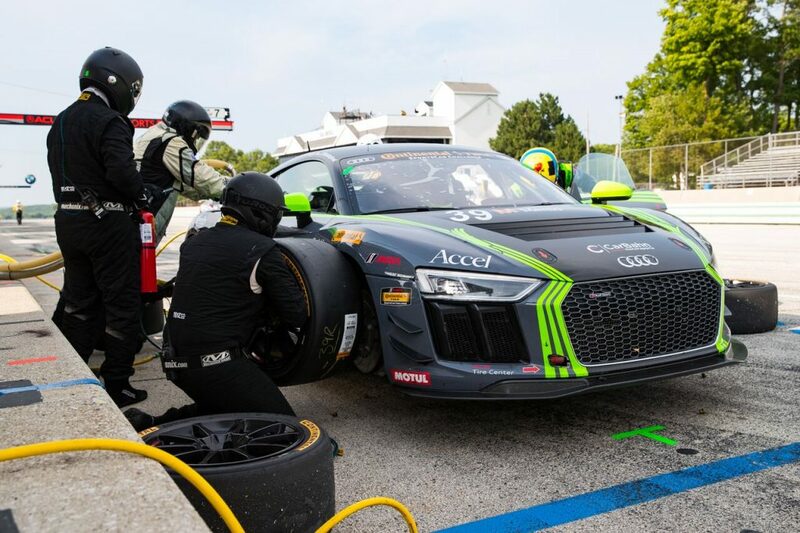 The #39 Audi was the last car to pit, with a chance of making it to the finish without needing to stop twice for fuel, the only move to punch above their weight. The two veterans did just that, with Tyler running in the top 3 from the start of the race, and Westphal leaving pit lane in 17th and working his way through traffic with crafty moves on circuit forcing the faster car ahead into a bad position for the upcoming brake zone and corner, to then pounce on their poor position and pass into the following turn that doesn’t include a big straight away. The end result with 10 minutes of extreme fuel saving, reducing his lap time by 5-6 seconds and managing the gap to the cars behind, Westphal was able to run out of fuel as he crossed the finish line in a shocking 4th place (of 26), just 1 second behind the AMG ahead who was also saving fuel, but pit 3 laps prior to McQuarrie/Westphal and still had more fuel at the end of the race during post race tech inspection. Carbahn/Peregrine Racing will reconvene in 2 weeks, August 17th, 2018 for Round 8 of the championship at Virginia International Raceway where the team looks for their breakthrough podium after a season of top 5’s and 10’s. 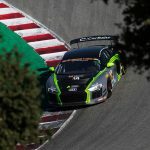 Follow the Team on their social channels, or stream the race live on Imsa.com, as well as a tape delayed broadcast on Fox Sports 1-week after the event date.